Sales in Illinois gun stores have risen in the past month, as gun owners fear their firearms will be confiscated or gun costs will rise due to potential legislative changes, gun-store owners said this week. The potential new laws stem from reaction to the Parkland shooting last month. According to Todd Vandermyde, executive director of Federal Firearms Licensees of Illinois, the first mention of stricter gun laws sets off a chain reaction that always seems to lead to panic among gun owners. Following the Parkland shooting, the opening lines to this latest act in a tired, nationwide drama are being written: Gun control is, once again, in play. A new cast, however, may be waiting in the wings. In Illinois, lawmakers on Wednesday will vote on whether to bar individuals under 21 from acquiring certain firearms and high-capacity magazines, and to impose a 72-hour waiting period for gun purchases.Gov. Bruce Rauner vetoed a bill one day earlier that would have newly applied licensure requirements to gun dealers. Yet, advocacy in support of legislative efforts to both regulate and deregulate firearms has taken on a newfound poignancy in the wake of the Valentine’s Day killing of 17 students and staff at Marjory Stoneman Douglas High School. Prominent groups on both sides witnessed a surge in interest following the shooting, they say, with significant input from volunteers – some of whom were previously on the sidelines. “It’s because we’re all from here,” said Eileen Soderstrom, 71, a retired IT specialist and board member of People for a Safer Society, a Chicago-based gun-control group. As the one-month anniversary of the Parkland school shooting nears, and lawmakers debate provisions for gun safety and reform, Chicago-area educators say that arming teachers is not a viable solution and challenge the nation’s leaders to find alternative solutions. Walsh is not alone in his sentiment as other teachers have called the idea “wild,” and worse, and declare they are completely against arming teachers in schools. More than 30 years ago, Satnaam Singh Mago’s grandfather was murdered by gun in the United Kingdom. Mago, 33, a second-generation American in the United States, now actively participates as a speaker and panelist against gun violence and advocates for commonsense gun laws and for people to take an academic approach toward gun culture. 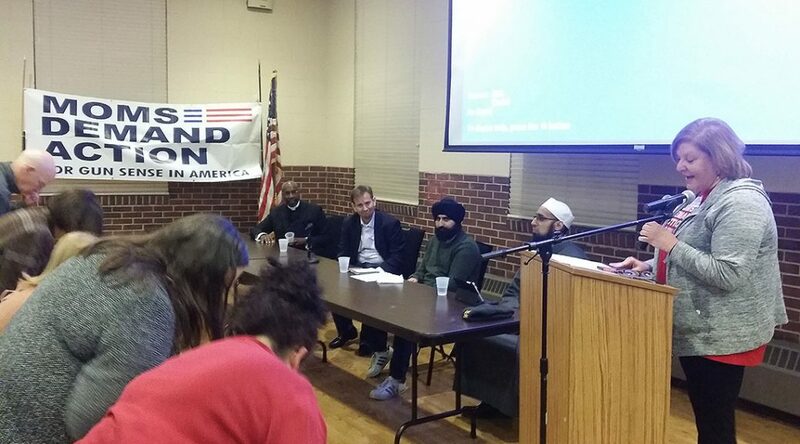 On Feb. 21, a week after the Marjory Stoneman Douglas High School shooting, Mago joined an interfaith panel against gun violence at the Libertyville Civic Center in the northern suburbs. The Florida shooting also sparked activism from the surviving students, who are rallying through news appearances, town hall meetings and social media to call for tighter gun control. This has caused a push back from the National Rifle Association, which continues to argue that Second Amendment rights be protected. Amid this debate and with the recent series of mass shootings, immigrants to the United States are left wondering about the country they have moved to – a country they believed would provide a better life. Some have chosen to speak out, others have opted to be more cautious about the places they visit, rejecting crowded events like concerts, while some others have considered buying guns to protect themselves. The shootings at Marjory Stoneman Douglas High School in Parkland, Florida, demonstrate that the emotional impact of a tragedy leads people to question the existing security measures and demand for some reinforcements. The expanded use of metal detectors, lock-down policies and surveillance cameras, however, also challenge people’s freedom. Are individuals willing to trade liberty for security? How much freedom are they willing to sacrifice? Do restrictive measures really make people feel safer? In the weeks following the Parkland, Florida school shooting, Chicago-based psychologist Nancy Molitor noticed that the tragedy was surfacing repeatedly during sessions with her patients, even though it happened more than a thousand miles away. “They were coming in for other issues, but it was the first thing on their mind,” said Molitor, who specializes in mood and anxiety disorders. “This shooting in particular, I think impacted the public as a whole, even if they haven’t been witnesses,” she said. School social worker Katie Prahin also noticed an increase in anxiety among the students at her Catholic school in Chicago.